We will work with you every step of the way to create a tailor-made design that is a reflection of your individual lifestyle. Consultation: One of our designers will visit with you at your home asking all of the necessary questions to determine what your vision is. They will measure the yard, consider the location for usability, and explain all of the options available to you. Our designer will have a custom design of your project, along with detailed pricing information. Excavation: Prior to excavation, we will show you the layout of the pool and make sure the layout is to your satisfaction. Now, we begin by performing any necessary demolition, grading and excavation, or digging out the site. Plumbing and Electrical: At this phase, we install the pipes and perform the initial phases of electrical work prior to inspection. We also install the equipment such as filters, pumps, and heaters. At this point, we begin installing reinforced steel bars, or rebar. Shotcrete: A thick layer of sprayed concrete is applied to the reinforced steel bars, which creates the actual shell of the pool. 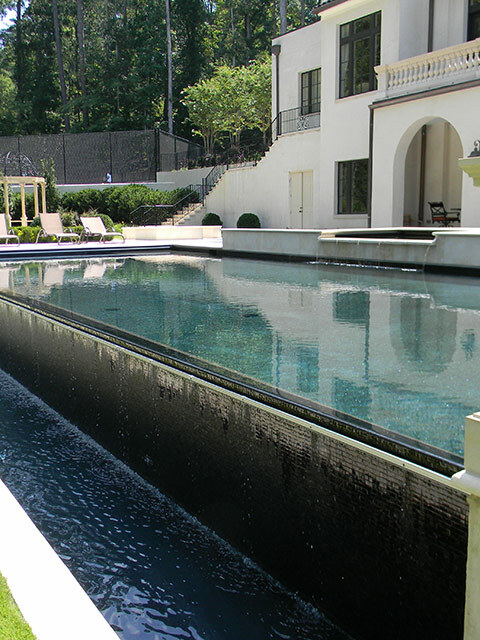 Coping and tile: Once shell is complete, we install the coping and tile for your pool. This is the phase in which any hardscapes like custom walls, waterfalls, fireplaces will be constructed. Decking: During this phase we complete the decking of your choice whether it is concrete, natural stone, pavers, or decorative concrete. At this point, all fencing should be in place prior to the last phase. We cannot fill any pool with water without the necessary fence in place. Plaster: This is one of the final phases of the entire process. Once complete, your pool is ready to be filled with water.